*Note: IF DVD IS MISSING--The DVD is a mini and often gets lodged inside the red PVC piping. Quilt like you have a longarm machine. Use this 3-roll quilt frame with your sewing machine for no-baste free motion machine quilting or hold in your lap for hand quilting. 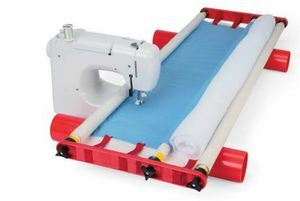 Now includes two roller pipes made of PVC, three fiberglass rods for rolling the quilt easily and smoothly, side tension ribbons, three muslin leaders, plus an instructional DVD. Accommodates quilts up to 38" wide. Use this 3-roll quilt frame with your sewing machine for no-baste free motion machine quilting or hold in your lap for hand quilting. Now includes two roller pipes made of PVC, three fiberglass rods for rolling the quilt easily and smoothly, side tension ribbons, three muslin leaders, plus an instructional DVD. Accommodates quilts up to 45" wide. Note: owners manual. Page 4 has a list of included parts. The metal pipe mentioned in the owners manual is purchased at a hardware store by the customer and is not included ( see page 4 "for longer rods").